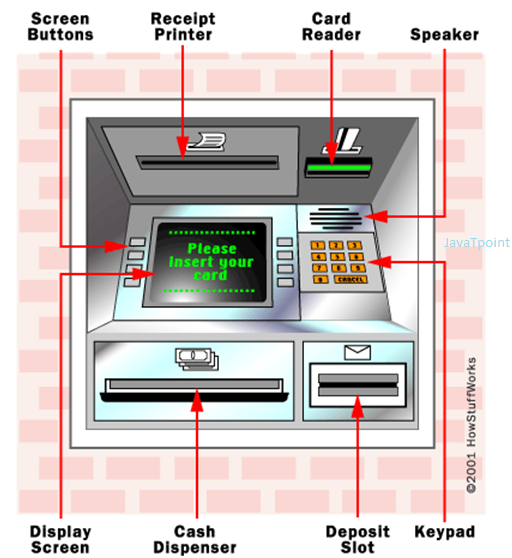 Here, you will get the answer of following ATM related questions: what is the full form of ATM, what does ATM stand for, what is the meaning of ATM, how ATM works and what does ATM. The full form of ATM is Automated Teller Machine. ATM is an electro-mechanical machine that is used for making financial transactions from a bank account. These machines are used to withdraw money from personal bank accounts. This makes banking process very easy because these machines are automatic and there is no need of human cashier for transaction. The ATM machine can be of two types; one with basic functions where you can withdraw cash and another one with more advanced functions where you can also deposit cash. Card Reader: This input device reads the data of the card which is stored in the magnetic strip on the back side of the ATM card. When the card is swiped or inserted into the given space the card reader captures the account details and passes it to the server. On the basis of account details and the commands received from the user server allows cash dispenser dispense the cash. Keypad: It helps the user to provide the details asked by the machine like personal identification number, amount of cash, receipt required or not, etc. The PIN number is sent in the encrypted form to the server. Speaker: It is provided in the ATM to produce the audio feedback when a key is pressed. Display Screen: It displays the transaction related information on the screen. It shows the steps of cash withdrawal one by one in sequence. It can be a CRT screen or a LCD screen. Receipt Printer: It provides you the receipt with details of transactions printed on it. It tells you date and time of transaction, the withdrawal amount, balance, etc. Cash Dispenser: It is the main output device of the ATM as it dispenses the cash. The high precision sensors provided in the ATM allows cash dispenser to dispense the correct amount of cash as required by the user. To start the functioning of ATM, you have to insert plastic ATM cards inside the ATM machines. In some machines you have to drop your cards, some machines allows swapping of cards. These ATM cards contain your account details and other security information in the form of a magnetic strip. When you drop/swap your card, machine gets your account information and asks for your PIN no. After the successful authentication, machine will allow financial transactions. Bill payments and mobile recharge etc. The first ATM was used to dispense cash for customers by Chemical bank at New York (USA) in 1969. Note: PIN is a 4 digit security number provided by the bank with the ATM card. PIN number is changeable, you can change it according to your convenience. Inventor of ATM: John Shepherd Barron. ATM Pin Number: John Shepherd Barron thought to keep a 6 digits pin number for the ATM, but it was not easy for his wife to remember a 6 digits pin so he decided to prepare a 4 digits ATP pin number. World's first floating ATM: State Bank of India (Kerala). First ATM in India: Installed by HSBC (Hongkong and Shanghai Banking Corporation) in 1987. First ATM in the World: It was installed on 27 June 1967 at the Barclays Bank of London. First Person to use ATM: The famous comedy actor Reg Varney was the first person to withdraw cash from the ATM. ATM without an Account: In Romania, which is a European country, one can withdraw money from an ATM without having a bank account. Biometric ATM: Biometric ATM is used in Brazil. As the name suggests, the user is required to scan his or her fingers at these ATMs before withdrawing money. World's Highest ATM: It is installed in Nathu-La mainly for the army personals. Its height is 14,300 feet above sea level and is operated by Union Bank of India. Let's see the image of ATM machine. 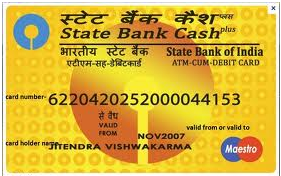 Let's see the image of ATM card.